TALLINN, Estonia – Estonia Public Broadcasting recently upgraded its OB van with a HARMAN Studer Vista 5 M3 digital console. The organization chose to make the upgrade in anticipation of the Estonian Song and Dance Celebration, which took place July 4-6 in Tallinn. 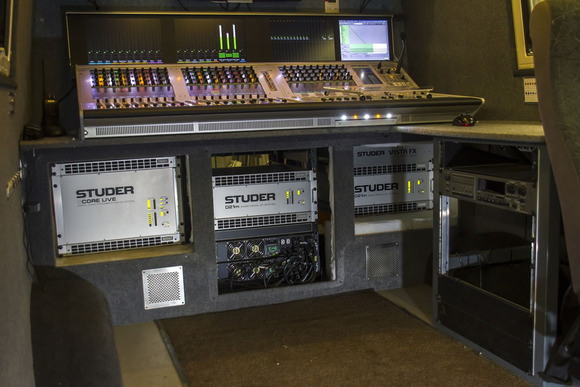 Sold through ProMedia Inc., Studer’s Estonia distributor, the Vista 5 M3 is being used to mix all audio through EPB’s OB van. The console is also complemented with Studer’s Vista FX engine, a 2U chassis that offers Lexicon surround effects and a graphic EQ, all controlled through the Vistonics™ user interface. Connection to the console’s DSP engine is made directly via two high-capacity multichannel HD links. The Studer Vista 5 M3 is ideal for small to midsize studios and OB trucks, thanks to its compact size and simple connectivity. The total I/O capacity, comprising various cards including mic/line, ADAT, TDIF, AES/EBU, SDI and MADI, may exceed 1,700 inputs and outputs. Martinonis also pointed out that durability was also a key factor in choosing the Vista 5 M3. “It was important to have a console that could perform in higher temperatures and could absorb the movement and bumps that come with being in a portable truck,” he said.